Laser Tag... A Game of Wits and Cunning, Stealth and Strategy. Game that has come of age. We began this site on January 31st 2000 to give like minded people a place to congregate and a place to find the next arena to conquer. 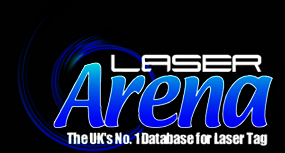 Laser Arena has just turned 18 years old. We feel it is now time that we step away from this website completely. In the beginning there were many fledgling websites for manufacturers and the information we wanted was difficult and nigh on impossible to find. Over time, the manufacturers and the arenas themselves have created a fantastic web presence for Laser Tag as a whole. We, as we are, are Obsolete. cried as we watched old Arenas crumble and close. At the peak of this sites popularity we were pulling in over 10,000 viewers per day. We currently stand at just under 3 Million Viewers for the life of the site, which is no mean feat. step away and allow the internet traffic to go where it is meant to. To the Arena's and Manufacturers own social media, websites and online platforms. We have had a wild ride with you all over the past 18 years and would like to thank the Manufacturers firstly. single largest (at the time) website for UK Laser Tag. Your support has helped us grow, not only as a website, but as individuals. We do things in our own lives now that we would never have thought possible before Laser Arena. So Thank You. You gave us so much more than you know. To the Member Arenas. You have been the heart of this site. Without you, we would simply not have existed in the first place. Keep going, keep entertaining the masses and most of all? Enjoy being Game hosts. There is nothing like it in the world. the globe! You kept us going when we thought there was no point. You are the reason we stayed. And now, in order that you get the right information from the right place? You are the reason we must go. The site will be live and operational until the end of March 2018. Then, we will be gone. You will still be able to find archived copies of the site on the Way Back Machine on Google if you so wish. This has cached the site right back to the start! The Domain will remain live and you will still be able to email us if you need anything at all. Thank you all for the wildest of rides.